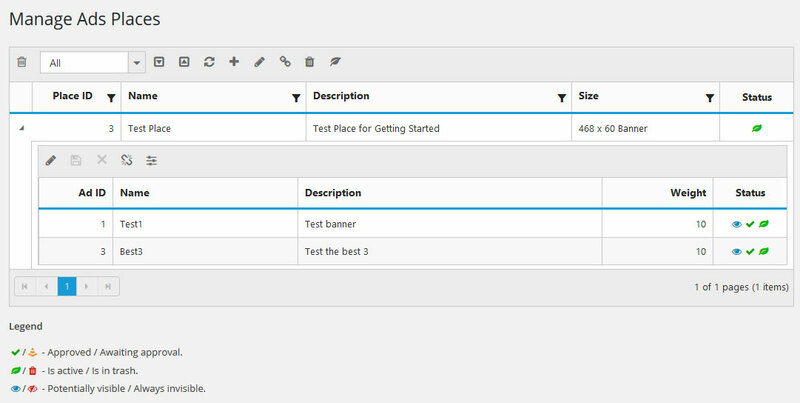 If you’ve never used the plugin “Simple Ads Manager” and have no idea how to handle this plugin, this article is for you. Also it is highly recommended to read this article at first. If you have already successfully installed the plugin, you should start placing ads on your site. After all, for that you have purchased the plugin. First of all you need to create one or more Ad Objects. Then you need to create an Object Place to ensure rotation of created ads. Fill in the fields “Name” and “Description” of your choice. 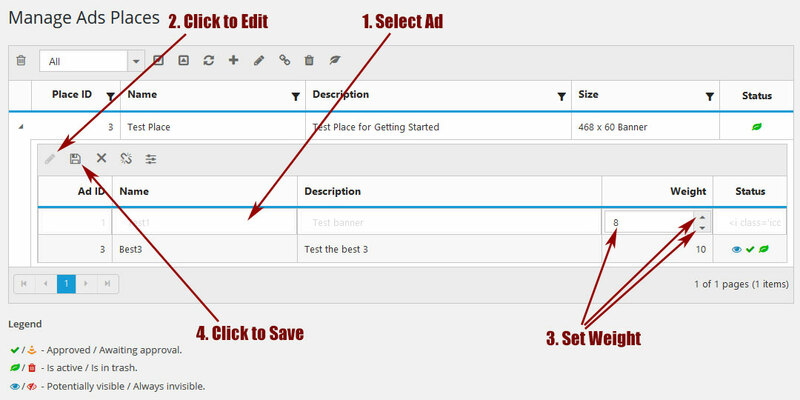 Select ad size from the dropdown list or define your own ad size. Save ad. Repeat these steps to create as many ads as you want. Fill in the fields “Name” and “Description” of your choice. Select Place size from the dropdown list or define your own Place size. After Place will be saved, you can link any existing ads with this Place. 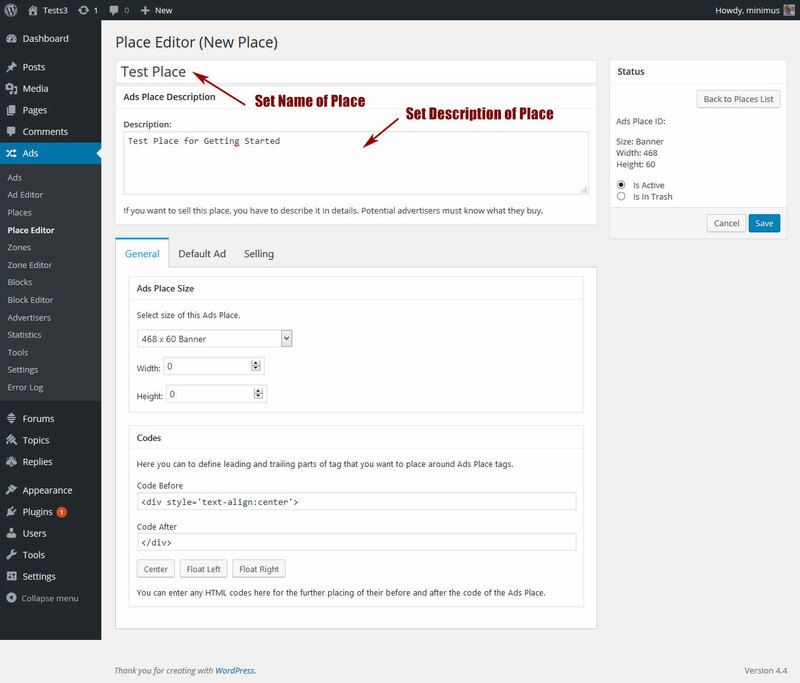 You can do it on the Place Editor page or on the Places Page. 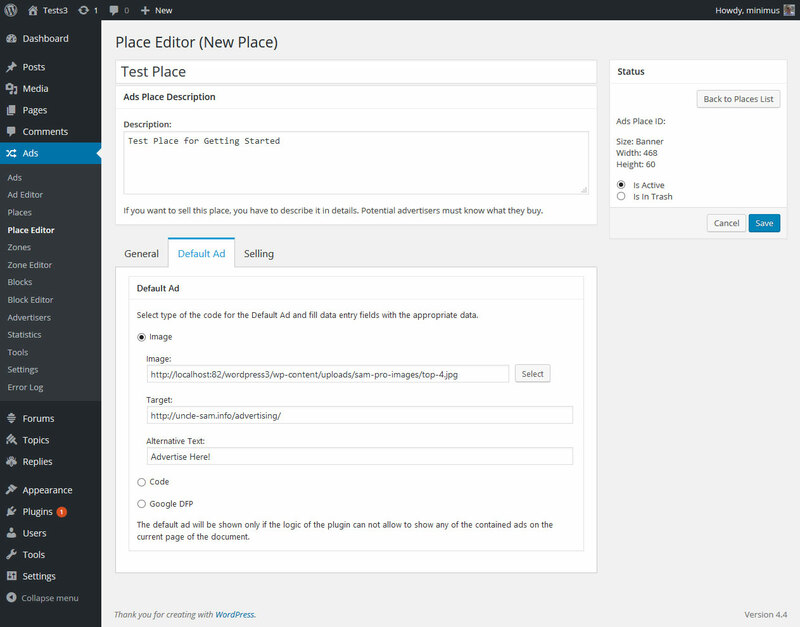 For linking ads with Place on the Place Editor page just click button “Link Ads” on the toolbar of the Linked Ads data grid. For linking ads with Place on the Places page you should select this Place from the data grid then click button “Link Ads” on the toolbar. In opened dialog select necessary ads (Ctrl+Click) then click “Select” button. Multiple Through Page Selection is available. Now you can set the weight for each linked ad (optionaly). Thats all for the first time. 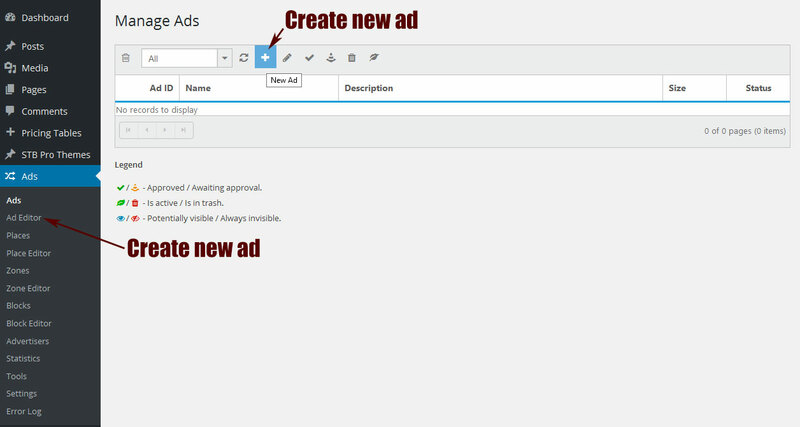 Now you can place your set of ads in any place of your site. More info for Lite Edition and Free Edition… Also you can find on this site instructions how to use Zones and Blocks. 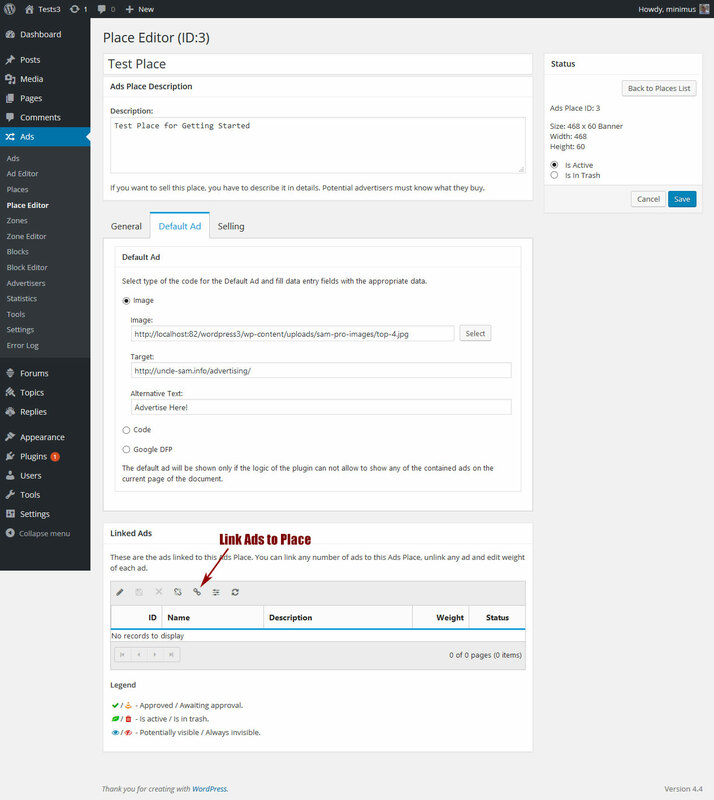 This functionality is available in both editions of the plugin. Show the ad only on the certain pages of categories (single posts and archives). / Do not show the ad on the certain pages of categories (single posts and archives). Hi, thaks to your help its done, i need license for two webs, in the pro version, but there is not a price or purchase buttom on the description table, please let me know how to get that license, or get two lite version licenses? Hi, william! Link to the saling page is on the home page of this site at the bottom of the pricing table. You should buy Regular License for each site ($20/site) or one Extended License for product ($100/product). 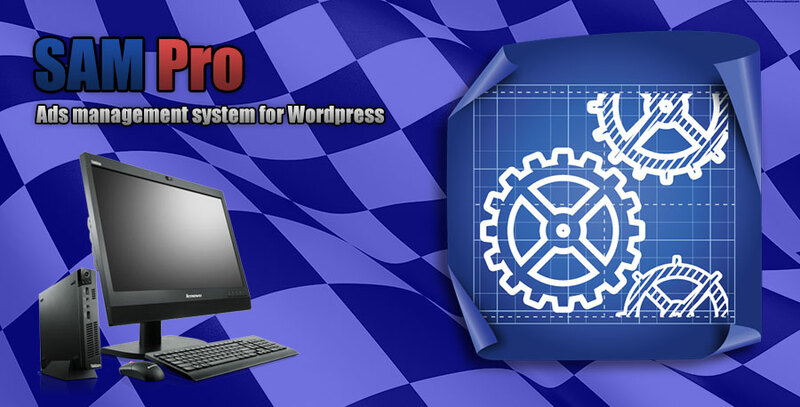 Usually Extended License is for themes developers (not for site developers). Sorry, I could not answer right away – just returned from a business trip. Used in the past SAM. Followed security advice to Pro Free, because I couldn’t find an overview about the prices and the difference between light and full. and that is working. After that, I removed the old SAM. Given the fact there is an opportunity to combine an advertisement to category and tag, it would nice to have a text ad, for let’s say 4/5 lines of html or in combination with a smaller banner. Is that possible ? 2. Restrictions and rules work only if the ad is included into the Place’s set of ads and you use Place itself or as a part of Zone or Block. 3. You should use Code Mode. Looks simple, same as  , a litte lack of information ? Took hours to find out, that I don’t understand. I will try, but the first idea was, that code mode was ment for the code supplied by the advertisement – intermediates. 1. SAM Pro (Full Edition) is not ready now. 2. Read this article at first. 3. Code is code. You can use third party codes or your own. 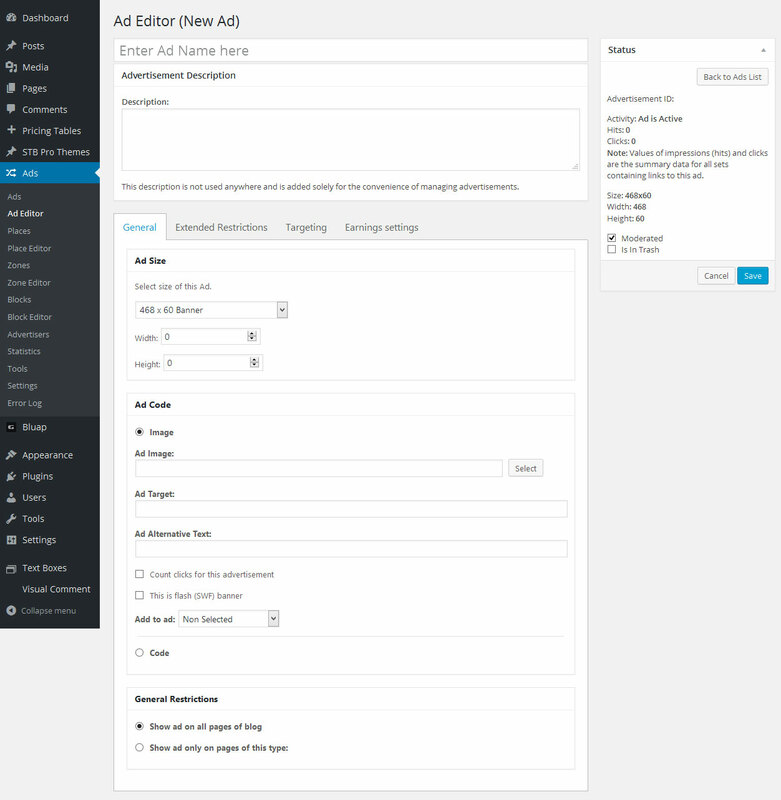 additional : this single ad holds in the ad editor “add to ad : nofollow” wich is important. Looking in the source of the page, there is a a blank prohibited, but no nofollow. For Single Ad this feature available only in SAM Pro Lite plugin. As before, a serious lack of info, because the dropdown list let’s select the option, and remembers that particular option. Next to the fact, Google is critical about commercial links. Quite a problem for “free” users. Is it possible for these plugins to work with an ad network/ad marketplace as well as your own custom created ads? I’ve been looking for a plugin to display ads on my page and installed this one, then upgraded to the Lite version which is fine but I need to know if there’s a way to add timing to ads, I mean, I have 3 ads in an ad place, for example, and I need them to rotate every, let’s say 10 seconds. Is there an option for this?, I can’t seem to find anything about it. Please let me know. Set “Ads Rotatin” to “by timer“. Set “Interval of rotation” to 10. Thank you for your answer, I already found it and made the change, but ads are still not rotating by timer. I set the timer to 10 and 5 with no success. I’m very inexpert in this matters so sorry if it’s something obvious that I should be doing. Please let me know what’s the issue. There are no reasons to organize rotation by timer in the PHP mode, because this action needs AJAX requests. The plugin seems to have an awesome list of features. Can it do split-testing? In other words, automatically show ads that are getting the most clicks. I have several affiliate ads that I’d like to place in a sidebar, and it would be great if they could be automatically tested and then placed based on how many clicks they get. You can put ads being tested into one pool (Place) and set for each of them non-intersecting schedules. After the end of the test period you can explore data on the statistics page. It’s possibile wiht your SAM? Hi there, awsome plugin! I’ve created an AD and a PLACE and all is set. The only thing is that my HIT count is not working. CLICKS are ok (I have 25 so far), but only 2 HITS, how can it be? What am I missing? Thank you. Hello. Under my “manage Ads” I am not seeing any records or any kind. It says “No records to display”. But when I visit my website my ads are still running and cycling through per usual. Do you know of what sort of thing could have caused this?